My favorite picture of the king shown as he condescends to the lowly. This is a sad day in Thailand. The only King they have ever known for the last 70 years has passed away. He is the Father of the country that took them from WWII to the modern age. Shunning many royal practices of previous kings he became a king of the people. 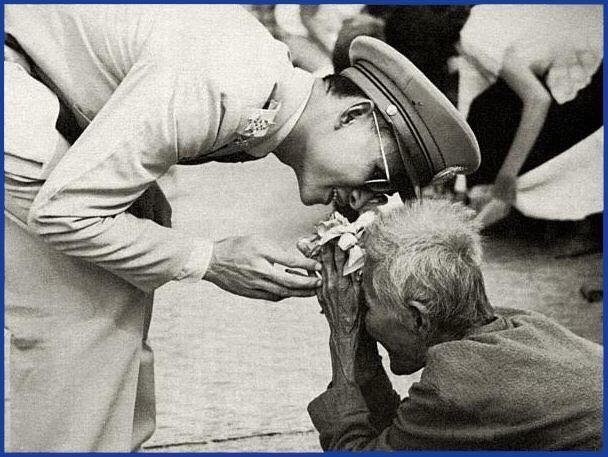 He spent his life for the Thai people, learning their needs and working to solve the problems. He traveled the countryside going into the neediest areas to learn of needs, and then turned the palace grounds into a testing ground in search of solutions. It is said that wherever he walked in Thailand, development and prosperity followed. He established country-wide education, even in the most rural areas. He created irrigation systems throughout the country to help farmers in both rainy and dry seasons. He stabilized the country in times of unrest, led with a gentle hand, and much more. He acted as a Father to the people of Thailand and they love Him as their Father in return. Today is a day of great mourning as if everyone’s father died together on the same day. TV is black and white. Entertainment venues are closed. Music in restaurants will stop for at least a month. FB profile pictures are solid black. Government workers will wear black for a year. This starts a year of mourning. People are stunned. This evening when the news broke, we were teaching a class at the church and someone burst in in a panic to tell the news. Outside the window someone walking by saw the news on a TV in a local shop and fell down crying. We thought she had been hit by a car. Our class stopped. People are uneasy about the future without the stabilizing presence of their king that they loved. He has always been there for as long as anyone can remember. Almost every conversation we have had, even before today, as they tell us about all that he has done, has been told with tears as they express who he is to them. Those that have never had a king like this may find it hard to relate, but he was truly special and will be greatly missed.